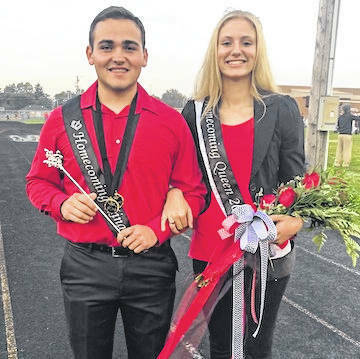 Cardington-Lincoln High School homecoming king and queen, Dylan Goodman and Paige Clinger. They were chosen Friday night. 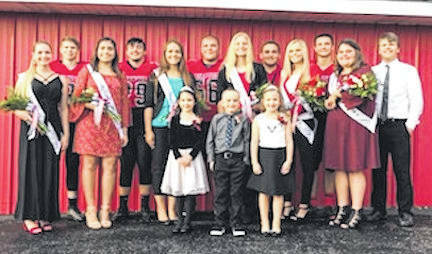 Back row, from left: Nate Hickman, Tristan Nichols, Deven Speck, Dylan Goodman, king; Branden Steckel and Noah Struck.Middle Row: Brooke Clapham, Ashleigh Morales, Delisa Goodman, Paige Clinger, queen, Kylee Edwards and Mikaela Osborne. Front row: Abby Branham, Branson Naylor and Lily Moodispaugh.